One of the many complaints I hear about using a Visa debit card for transactions is that they are not as safe as a credit card. Credit card transactions give consumers protection to dispute charges, thereby ensuring a thief does not wipe out their entire bank account. Since debit cards pull the money from the bank account at the time of purchase they are more open to fraud, or so the thinking goes. Mostly the safety issue with a Visa debit card results from the use of a PIN – a personal identification number. In theory the PIN serves as an extra barrier of security in that you must enter it before completing a transaction. However, the problem comes when someone unknowingly steals your PIN. If someone had your debit card number and your PIN they could use your debit card for transactions and empty your account. Stealing your PIN is easier than you think too. The transaction terminals at most businesses and ATMs are wide open. That person standing behind you or even the cashier could easily sneak a peak at the code you are punching in. If those wandering eyes are also able to see/get your debit card number they’d have all the information they need. So you really need to keep your PIN a secret. Memorize it and never keep it with you. Don’t let the cashier enter in your PIN. Don’t give it out over the phone. Never share it with anyone over the phone, online…not even at your bank or financial institution! But there is even a better option than just keeping it secret. This practice will make sure you have all the protection you need. This may seem really confusing since I just said you needed the PIN to complete a transaction. However, the truth of the matter is this – you don’t need a PIN to complete a transaction with a Visa debit card. I’ve never used my PIN for any purchase. In fact, I’m not even sure what it is. The more effective and safer way to do it is to sign for your transaction. Here is how that works and why it’s beneficial. Instead of pressing the “debit” button on the keypad when you swipe your card, press the “credit” button. When this happens, your transaction routes itself through the Visa network. Your Visa debit card is still working like a debit card in that the transaction is deducted from your checking account immediately. This process forces the transaction to require a signature to complete – either a physical paper receipt or by signing electronically. Once you sign, Visa grants you all the same security protections that a credit card holder would receive. The business may not require you to sign at all (like for smaller purchases or at gas pumps). That is OK. The protections still stand because you selected credit instead of debit. Visa’s Zero Liability Policy, which protects the consumer against unauthorized charges. Funds that were fraudulently taken from your account will be returned. But the protections only apply if you choose “credit” to complete the transaction. What If I Choose the Debit Option? It is your choice to use the debit option with the PIN. However, you may lose funds if your bank account information is stolen. There are the ramifications for that type of scenario according to the Federal Trade Commission. Call your bank before any unauthorized charges take place and your maximum loss is zero dollars. Contact your bank within two business days after you realize a theft has taken place and your maximum loss is $50. Call the bank more than two business days after a theft but less than 60 calendar days from when your statement is sent to you, then your maximum loss is $500. Contanct your bank after 60 calendar days from when your statement is sent and your losses could be unlimited. I’m not sure why more consumers don’t know this. It makes no sense to use a PIN and void the protections Visa offers. Yet I know I’ve seen people using their PIN in the checkout line instead of signing a receipt. Maybe they don’t want to wait the few extra seconds for the receipt to print and then sign it. That seems really silly considering the protections they are voiding. But in our hurry up, get moving society it wouldn’t surprise me in the least if people thought this way. Or it might just be ignorance of the process available to them. I confess, I didn’t know about this when I got my first debit card. If you know of anyone using their PIN with a debit card forward them this article. 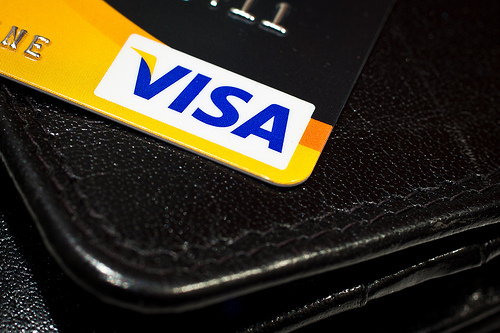 If they have any further questions about this, they can visit Visa’s debit card FAQ page. And for other information on how to use a debit card safely see “Protecting Your Plastic From High Tech Criminals” at the FDIC. Finally, one last thing to keep in mind. These cards are even more secure with the new EMV chips that are being used. These started being phased in around 2015 in an effort to further enhance security for the consumer. That’s good news. Check out this article about the EMV chips if you want to know more. Even with the new chips though I’m still not using my PIN. I’ll keep saying “credit” every time I check out. Questions: Do you use your PIN for Visa debit card purchases? Did you know you could call a debit card purchase a “credit?” Have you ever lost money from your account because someone stole your PIN? How was that resolved? Using a credit card for purchases definitely gives you some peace of mind. I recently had a charge come across from the east coast (I live in WA). It was quick and easy to dispute the charge and it was removed from my account the next billing cycle. Unfortunately we had to have new cards issued which forced us to update all of the accounts that we have tied to our credit card. Fortunately with my first debit card the bank charged me a fee every time I used it as debit so I was trained to always just choose credit. I didn’t realize that credit transactions on a debit card were covered, good to know! I assumed that any transaction on a debit card was riskier. I never thought that I could use my card without my pin. It seems like this method is more secure and advantageous, Brian. Thanks! Good advice…..except you can’t process an ATM transaction as credit. You’d have to physically go into a bank to do a withdrawal. But if that’s the only price you’d have to pay for peace of mind, it’s a small one. Personally I feel fairly comfortable using my PIN for transactions. I usually try to look around to make sure nobody is standing obtrusively close to me when I use it though. “…you can’t process an ATM transaction as credit.” Right…a PIN is necessary for an ATM. But I never use an ATM…always prepare in advance and get the cash I need inside the bank. I never knew that using a debit card with the credit option would add this protection. Great tip! I use my debit card for very small purchases only, and will have to start doing this to make sure I’m safe. I would never use my PIN…it’s just a riskier move than choosing the credit option. Wow. I had no idea it gets routed differently when you use it as debit. I have switched, for the time being anyway, to using credit cards anyway for rewards. I’ve been doing it for months, and so far it’s worked great. No interest. I will be sure to remember this if I switch away from cards. I’m also going to make sure my family knows this. Thanks Michael. That’s why I wrote this because many don’t know you can use a debit card in this way. Before I started reading I was hoping you were going to say “always use it as credit” (which is basically the same thing as what you did say – never use your pin). This little secret is the key to using your debit card (i.e. cash) as a credit card because you get all the protections of a credit card but only have access to your own money.